This fall, the Force can finally be with you  for a suggested retail price of $129.99. Put on a headset, focus on a small ball in a cylinder, and use your mind to make the sphere rise. It’s cool, not to mention a little strange. Stranger yet, Uncle Milton’s Force Trainer wasn’t the only levitational gadget at this year’s American International Toy Fair, the four-day trade show that brings a gazillion manufacturers and retailers together every February in New York City. 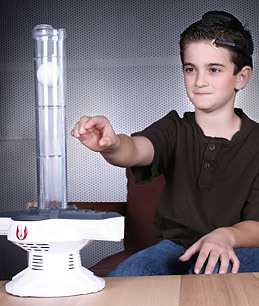 Also on display was Mattel’s new Mindflex, which has players move a tiny foam ball through a mini-obstacle course with their thoughts. Or, more precisely, with their brainwaves. Just think of it as a drinking game, an onlooker said during the Mindflex demo at the Toy Fair, which, irony of ironies, does not allow any kids inside. The $79.99 game, like Uncle Milton’s Force Trainer, is intended for ages 8 and up. The Force Trainer  which is limited to moving a ball up and down in a tube  may not be as complicated as Mindflex. But it does, however, have Star Wars branding, which possesses a magical retail power all its own. The toy features 15 levels of training, i.e., increasingly difficult challenges involving how high to raise the ball and how long to hold it steady before changing its height. Along the way, Yoda and Obi-Wan Kenobi offer words of encouragement as hopefuls try to attain Jedi Master status. May your limited discretionary-spending power be with you. See pictures of the best animated movies.